Beautiful and private 1,800 square foot chalet on acres of property that backs up to county land with nature trails, wild life,streams and hiking. We are 5 minutes from Shanty Creek Resort Areas. This Property is part of the Chief Golf Course Resort. The Home is located within 10 minutes of the chain of lakes and the Jordan River. Cabin is very private and is located at the very end of the Spring Ridge Condo Association Subdivision. Minute's from The Chief,Hawks Eye,Legend Golf ,Shuss/Shanty Creek,Ski Resorts,Snowmobiling,Boating on Torch,Bellaire,Chain of Lakes,Much More Minutes away from The Chief Golf Course, Hawke's Eye Golf Course and the Legend Golf Course. Minutes away from Torch, Elk and Lake, as well as Schuss/Shanty Creek Ski Resort. There is a minimum age limit for renters, please enquire for details. TV (Dish Network): 42' Flat Screen TV Share our home away from home, in the Spring Ridge Condo Association - in connection with The Chief Golf Course. The cabin has 3 bedrooms, 2 full baths and sleeps up to 10. Custom decorated with wood floors, tile baths and carpeted bedrooms. Property backs up to county land with nature trails and hiking. Master suite has a queen bed with large, private bathroom with custom tile 5' x 6' shower with large glass door/frame. Master bath also has heated flooring and double vanity with lots of counter space. 1 bedroom queen bed /Bunk Bed and closet. 1 bedroom queen bed, closet, dresser and mirror. Lower full bath has shower and single vanity. All linens/towels are included. There is a washer/dryer on site. Large front deck with southern exposure for sun bathing in private or grilling out. The house was clean and modern and have everything that we needed they only thing that would’ve been nice to have some more kitchenware for cooking. It was a great Family & Friends weekend! The cabin was great! Had plenty of room, very clean and was very privately located. The view from the deck was beautiful! Owner was great! Had issues with the heat and he got someone there right away and took care of us. He was great getting back with us and was super nice! Would definitely rent again in the future! Location was perfect for us! Short drive to Travers City, Sleeping Bear Dunes and Potoski! Great scenery, met all expectations even a fire pit which wasn't listed. Only complaint is the fan that needed dusting in the living room that threw off dust bunnies on the couch and in our drinks and food. The good: This chalet had plenty of comfortable sleeping space for everyone in our party of nine. It was cozy, had a beautiful view, and was in a great location close to Bellaire in a peaceful woodsy setting. The not-so-good: Even though this cabin's sleeping arrangements fit ten people comfortably, the rest of it did not. There were only four chairs around the dining room table, no bar stools, and not even a coffee table on which to eat. With only one sofa and one chair in the living room, there was not enough comfortable seating for our party. We were forced to find folding lawn chairs in the basement so that everyone would have a place to sit. The gas fireplace worked fine most of the time we were there, but it took a bit of ingenuity to get it to start when we first arrived and by the evening before we left, we couldn't get it going again. I understand that kitchen and other items often "walk away" from rental units, but someone should really see that the kitchen remains well-stocked with basic items, such as measuring spoons, at least two large-sized pots, more than two wine glasses, mixing bowls, strainer (which we had to purchase), and several more decent knives. Oh, and a hair dryer. And lastly, we were disappointed when we could not watch the Rose Bowl on New Year's Day because the Dish Network in the house didn't have the right channel showing the game. And my team was playing. Bummer! Finally, we were there to ski and were fortunate to receive about 16 inches of snow during our stay. While the small subdivision road was regularly plowed, the windy and hilly driveway was less-so. So, that made driving up and down the last stretch of driveway tricky even with a 4x4 with snow tires. I truly hate to write negative reviews, and if you have significantly fewer people in your party, then this chalet is a perfectly fine place to stay. For larger parties, I think most of these issues could be remedied to some degree by adding the right furniture, but it would still be close living quarters. - The house is back in the woods I can't control a record 16" of snow in one day . but snow was plowed every day . - We have a basic TV dish package can't guarantee I will have guests favorite sports team . Beautiful spot. Easy owners to work with. The place was beautiful and the view unsurpassed. It did take some getting used to getting up the steep drive, (and we were there in August), so heed warnings about the need for 4-wheel drive in winter weather. The owners were very responsive. Other commentators have noted that they had no dishwasher, and the home is on well water. But, for our three couples, we managed just fine. The close proximity to horseback riding and to Bellaire (and Shorts!) was certainly a plus. Great location. Clean and updated. Booked it for a golf trip with a large group. Didn't disappoint. Good view, nice and secluded. 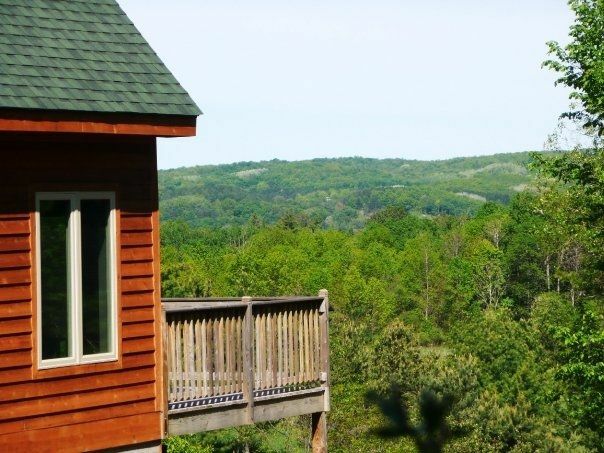 Close to Bellaire, Torch Lake, and multiple nice golf courses. Would love to get back and see it in the winter.